The Energy Department announced today $7.25 million for six organizations that will continue to advance water power as a viable resource for America’s clean energy portfolio. 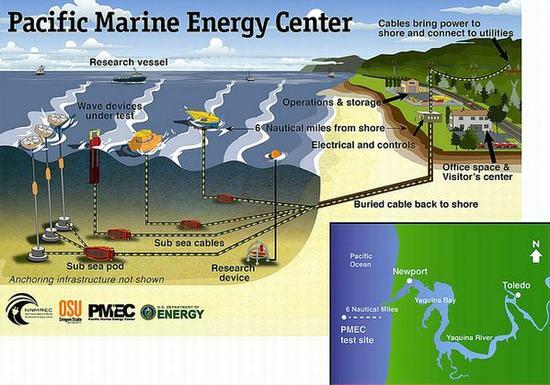 Marine and hydro-kinetic energy (MHK) technologies convert the energy of waves, tides, rivers, and ocean currents into electricity that can be used by homes and businesses, especially in coastal regions of the United States. This funding will aide in the development of advanced instrumentation for environmental monitoring and data collection and support a partnership between three universities to accelerate the development of cost-effective MHK technologies. Five organizations will receive a total of $3.25 million to develop and integrate instrumentation and processing techniques that will monitor and help reduce the environmental impacts of MHK technologies and collect physical data on ocean waves such as height, period, directionality, and steepness. The data will allow MHK devices to more accurately assess approaching waves and more efficiently harness their energy. Pacific Northwest National Laboratory will develop integrated computer hardware and software algorithms into a small package capable of withstanding harsh ocean conditions, and will use real-time active acoustic data streams to detect, track, and characterize nearby aquatic wildlife. The University of Washington will develop open-source software to analyze visual data of marine animals in order to classify them and monitor their activities around MHK devices for future research. Additionally, the University of Washington will develop and test an integrated instrumentation package to capture important but rare events such as the presence of marine animals, without creating excessive data streams. Scientific Solutions, Inc. of Nashua, New Hampshire, will develop a noise measurement system for use during MHK project testing, installation, and operation. The system will measure and analyze the noise produced by MHK devices to reduce environmental impacts and guide future research efforts. Florida Atlantic University will develop and test a Light Detecting and Ranging, or LiDAR, monitoring system that uses pulses of light to determine the location and movement of objects. The system will provide automated tracking and classification of animals near MHK equipment, notify researchers when animals are present, and provide high-resolution imagery of their behavior. Oregon State University will develop and demonstrate a system for real-time wave forecasting near the shore, which will allow wave-energy devices to be tuned to capture the maximum amount of energy from incoming waves. The system will use data from wave-imaging marine radar and a specialized data assimilation algorithm. In addition to the projects listed above, the Energy Department announced today that a new consortium led by Oregon State University, and including the University of Washington and the University of Alaska Fairbanks, will receive $4 million in funding to combine their field-focused R&D capabilities to accelerate the development and deployment of MHK technologies. Developing autonomous robotic devices to support MHK operations and maintenance. Designing arrays to improve the performance of MHK devices. Standardizing approaches for wildlife monitoring at MHK projects. The Department’s Office of Energy Efficiency and Renewable Energy accelerates development and deployment of energy efficiency and renewable energy technologies and market-based solutions that strengthen U.S. energy security, environmental quality, and economic vitality. Learn more about MHK technologies by visiting the Energy Department’s marine and hydrokinetic research & development webpage.